I was completely engrossed in picking raspberries in our berry patch when I noticed the cats belly-crawling through the flowers toward our little wood. I looked up to see a young muledeer doe. At first, I wasn’t sure what I was seeing because she had the bleached intact backbone of one of her ancestors in her mouth. She looked shyly toward me with glorious, fervent eyes. She paused, I paused, the cats paused. The three kittens had never seen a deer before. The deer had never seen me before. And, I had never seen a bone-toting ungulate before. 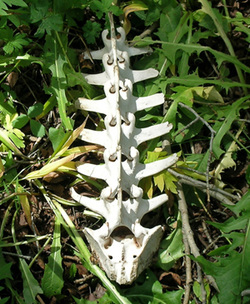 She calmly proceeded to chew away at the vertebrae, one at a time, until she had consumed almost all of the backbone. How wise! She needs calcium, because she is preparing for the rut, and will soon become pregnant with her first faun, whom she must carry safely in her womb through the long winter. As she wanders thoughtfully back into the spruce wood with the last of the bone in her mouth, I softly commend her on her wisdom. She is only a yearling and she has discovered a perfect source of calcium and other minerals. One plucked from an outdoor shelf on the back of my writing cabin. Over the years, on horseback rides and hikes, we have collected a menagerie of pearlized bones, stark cow and horse skulls and deer and elk femurs and vertebrae. When I first moved to Colorado from Chicago, I found the bones and antlers tacked to ranchers’ barns and the outbuildings of the small miners’ houses macabre and fascinating. Then as the long, arduous winters rolled back each year revealing the stark mammalian sculptures, I began to see these high mountain bas reliefs as elegant and mysterious in their stark simplicity. Now I have bones mounted all around the yard and on shelves and windowsills outside and inside the house. There is the gargantuan skull of a buffalo found in the Black Hills, exquisite deer pelvic bones and,lyrical (literally lyre-shaped) hoops of ribs all of which we have used in outdoor theatre and dance performances as powerfully evocative masks. There are the rare “bugle teeth” of elk through which they create their silvery mating-rut calls, the delicate skull of a weasel, beak and brain-pan of a hawk, the jaws and teeth of both a mountain lion and beaver and the tiny, fragile skeleton of a bat. As the glorious green and chartreuse of late mountain summer provides lush nests for our sculptural boneyard, the life-death-life cycle is etched in the palm of the land. Carefully, I lay out more of the doe’s ancestor, a jaw and two rows of perfect teeth. These are also the bones of a young deer, and perhaps our doe’s Greatest Great Grandmother. As I do this, I am reminded of the intensity of preparation for Autumn and the exquisite economy of the season. The doe’s spring baby will have strong bones created from the sacrifice of his ancient forebear. The doe’s milk will have vital minerals in it passed down through the flesh and bone communion of her mothers’ bodies. “I do this in a sacred manner. I do this thing so that all my people may live. I do this knowing that some day I may give my life so that your people may live. I will become food for the roots, plants and grasses. I will feed your relatives.